Have you ever been in the situation when you're sitting in a meeting with an important prospect, and all of sudden he brings up some information presented by a competitor that catches you completely off guard? Or you have the opportunity to talk to a writer for a publication and out of the blue she asks you about how you stack up against a competitor? Or worse, you're talking with a long-term customer and he tells you about a conversation with your competitor that doesn't accurately reflect the situation? Besides being uncomfortable, such surprises can create PR challenges at best and impact customer trust at worst. These kinds of ambushes are common. Luckily, it's something you can prepare for with a tool known as a message map. Message maps help you visualize how to best tell your story. Think of your message map as a framework for developing compelling, relevant messages for your various target customers. By applying the concept known as scenario planning, you can create a message map that reduces the chances of being "surprised" by a competitor response. Scenario planning is a method designed to help you anticipate possible events and their potential implications with the idea of formulating a planned response should that scenario occur. You can use this approach to incorporate potential competitor responses into your message map and develop both offensive and defensive messaging. Go on the offense and plan a solid defense. If creating such a message map is something you'd like to try, here are five steps to get you started. I highly recommend that you complete this approach in a workshop-style environment, ideally with a facilitator. 1. Before actually creating your map, you need to do some company reflection. It is important to know who you are, who your prospects are and who your primary competitors are. For example, if you sell training services, your audience might be human resources, the CFO, CEO or line of business leader. If you sell SEO services, your audience might be a content marketer inside a company or a website developer. What is their primary product message, and what evidence do they have to support the message? For example, this might be the material they use and if that's unique and compelling, or it might have to do with their design of the product. Think features and functions here. What is their primary product-related message and what is their evidence? This is something that is needed to make the product work. Ease-of-use messages, warranties or return or replace with no questions asked messages typically fall into this category. What is their primary non-product message and associated evidence? For example, deep domain expertise, where you trained, special certifications or licenses. Not sure what of your competitors' messages? Scour their websites, read their press releases and articles written about them, and check out their social media pages. If you have additional resources, invest in research and regularly conduct competitive audits. This is the beginning of your message map. 3. 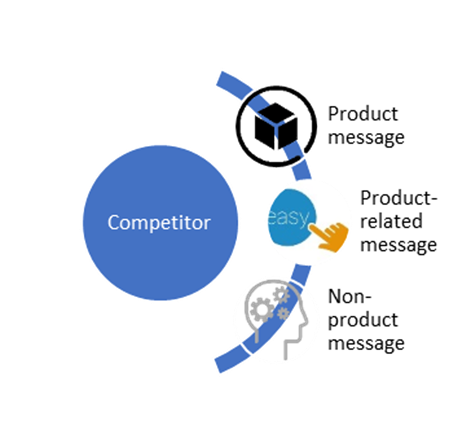 For each of your competitor's messages, craft your offense message and your defense message. For example, let's say your competitor uses a product message that claims its product eliminates more impurities than your product with evidence to support its claim. Offense message: Your product is made of a material that can withstand temperatures between X and Y degrees, which applies to X percent of situations. Defense message: Your product meets or exceeds the industry standard. 4. This is when you begin to consider potential scenarios. Step into the shoes of all your competitors. Brainstorm what message they might use to counter your offense and defense messages. Now, add these to your message map. 5. Finally, craft offense and defense messages to each of these potential competitive responses. Repeat the process until you think you've exhausted all the possible response scenarios. Once you're finished, you should have a picture that serves as a fairly solid playbook for how to handle potential countermoves by competitors in any conversation with a prospect. There are many ways you can use your message map. For example, it's an excellent way to support your sales training or develop better sales presentations. Having a message map helps reduce those uncomfortable silences when your prospect brings up a competitive message. Your map may also stimulate some ideas for new content, such as a blog post or white paper. A quality message map makes a powerful weapon. There's another valuable purpose of a message map: being able to lay landmines and ambushes for your competitors. As you create your map, you'll be identifying important chinks in your competitors' messaging that you can leverage to your advantage. For example, rather than trying to counteract with product-to-product messages, you might find that you are stronger and they are weaker on different fronts. For example, perhaps you are each stronger in equally important purchasing criteria, such as total cost of ownership or usage of your product by recognized leaders. This process also helps keep you from making price the primary arrow in your quiver. By identifying strong counter-messages, you may be able to actually charge more than your competition. Message maps are an often overlooked and underused tool for achieving competitive advantage. Use these steps as both offensive and defensive strategies to increase revenue and protect margin.